My name is Gwen Frost, and I go to Mythos Academy—a school of myths, magic and warrior whiz kids, where even the lowliest geek knows how to chop off somebodies head with a sword and Logan Quinn, the hottest Spartan guy in school, also happens to be the deadliest. I am a HUGE myth buff. I read every book about myths in my middle and high school libraries within the first year of attending them. I took folklore classes as elective classes in college and read mythological re-tellings at least once a month so I consider myself to be pretty knowledgeable about them. In modern mythological re-tellings, I always find it the really interesting to see who the author chooses to be the villain. Of all of the pantheons and mythological beasties out there, I'm sure there are countless options for bad-guy awesomeness and I really like seeing the reasoning behind the author's choice. In the Mythos Academy novels, the bad guy is Loki (from the Norse pantheon) and I thought that it was a kind of odd choice because even though Loki is known as a Trickster I haven't really ever seen him portrayed as evil. I was hoping to get some background as to why Loki was evil in this series, but mostly I just got jumbled prophesies and evil "sauron eyes" in dreams and stuff. I really wish there could have been more history and actual myth behind the gods, but I still found the plot likable enough once I convinced myself to think of the normally cheerfully devious Loki as s twisted, demented monster. Gwen was for sure an interesting character. Being a gypsy, she doesn't quite fit in at her school where everyone is a warrior. Gypsies have cool powers that no one else has, but they aren't flashy like the Amazons or super powerful like the Spartans which leads Gwen to be a kind of outcast. Still, she doesn't act like the moping outcasts in a lot of YA literature. She honestly doesn't care if she doesn't fit in and actually uses her skills to make money off her rich classmates. Yet there was a lot that bugged me about Gwen, the first and foremost being that she refused to believe in what was right in front of her. She complains about how boring and unbelievable Myth-History class is, even though she is sitting in class with some of the descendants of the gods and goddesses in her history books. She takes the disbelief so far as to say things like her classmates are delusional, but she is SITTING RIGHT THERE seeing them do these things...AND she has her own powers...so WHY is it so unbelievable? It isn't...which is why she kind of pissed me off. I really liked that the main goddess in this book was Nike. She is one of the least mentioned goddesses in Greek mythology, but was super important to battles and such which makes me wonder why she isn't used more in mythological literature. You always get your Aphrodite, your Athena, your Artemis...but rarely do you see gods like Hestia, Nike, Io, etc. I really got excited to explore a new goddess and to have fun in a world where I didn't already know everything about the goddess I was supposed to be "learning" about. Also, I loved that there was such a mixture of belief systems and pantheons at play in the school. Valkyries, Amazons, Ninjas, Spartans, Gypsies, and Samurai are just a few of the students who roam the halls at Mythos Academy and even though there wasn't a whole lot of development within the different types of characters, I think there is a lot of potential for the series and many places Jennifer could go with all of the different kinds of warriors. The writing style seemed a tad...clumsy. I have heard rave reviews about Jennifer Estep's adult series, so I was really surprised to find amateur style writing. For example, certain phrases and descriptions were used in such repetition that I was driven to distraction because I was so irritated at how often then were used. One of these phrases was "my violet eyes". I get it. Violet eyes are unusual. Gwen HAS violet eyes...which makes HER unusual. But I am a reader capable of pretty damn good reading comprehension and when I am told repeatedly about the main character's violet eyes, I can't help but feel like the author thinks I'm an idiot. Even in situations where no one freaking CARES what color her eyes are, Gwen talks about them....like "my violet eyes filled with tears" literally at the end of the book. WE GET WHAT YOUR EYECOLOR IS ALREADY. STOP TELLING ME ABOUT IT! The same goes for the "FrouFrou" food at the academy, Gwen's Purple Hoodie, and Logan (the love interest's) "Ice-Blue Eyes". I'd say that maybe Estep needs to invest in a thesaurus before continuing the series just so that she avoids killing any descriptive phrase she decides to use. The plot kind of meandered around for a while without having a direction or a purpose. We get to know Gwen and her grandma, we see Gwen hating on the local bad-boy for a bit and then him liking her despite the verbal poison she spits at him during every meeting, then there's a murder, but it doesn't seem to have too much releavance to the main plot of the book so people over look it. Don't get me wrong, I was entertained for the most part, and I admit, I had NO idea where the ending came from. I spent the entire book thinking..."Oh, I know where this is going". Right up until the end and BAM! I was slapped in the face with something completely different that what I thought.So that was nice...but despite my wanting to rave about the book I kind of feel a little "meh" about it. I debated a little bit about what rating to give the book, but in the end I thought Touch of Frost ranked at about a 3.5 Keys...though I really did think about going lower. The book is quite cliche, with a typical cast of characters and plot for a paranormal YA book. I also found the childish phrasing and dialogue to get under my skin an make me want to slap Gwen across the face. At the same time I got pulled in really quickly and actually read both this book and it's sequel in one day. So do what you will with this book. My vote is to try and win it from somewhere or get it at the library first to see if it's something you'd like. Happy Reading! Like Melissa, I am also on the fence with this series. I can't decide if I want to read it or not. I may give this first book a try and see what I feel. I won the 2nd book in this series, in a 4 book win (woohoo!) and I hadn't really heard much about it. I have looked into it a little bit more since, and it seems that the books got better. So, I will have to figure out a way to get this 1st book so I can read the 2nd. Sigh. 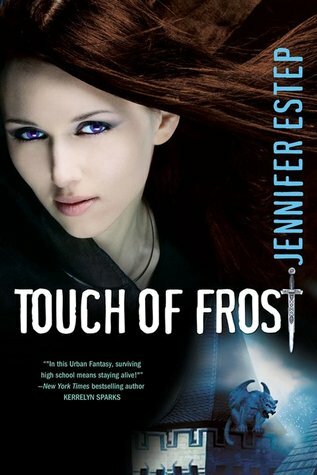 I don't drop many remarks, however after browsing through some of the remarks on this page "Review: Touch of Frost by Jennifer Estep". I do have a couple of questions for you if it's okay. they are left by brain dead individuals? :-P And, if you are writing at additional social sites, I'd like to keep up with you. Could you make a list of all of your social networking sites like your twitter feed, Facebook page or linkedin profile? It's actually a cool and helpful piece of info. I am happy that you simply shared this useful information with us. Please keep us informed like this. Thanks for sharing. Thankfulness to my father who informed me about this webpage, this blog is genuinely amazing. An individual automatically help to supply critically articles I might state. now? I astounded along with studies you made to make this actual post incredible. the identical away from date rehashed material. Great read! I've bookmarked your blog and I'm adding your RSS nourishes for my Google account. something of this nature before. Hence nice to seek out somebody with some original feelings in this subject. site is one thing that's needed throughout the net, a person with somewhat originality. helpful purpose of extending something fresh to the web! a result of I discovered it for him.. smile. So let me reword that: Thnx for the deal with! more about your post on AOL? I need a specialist on this area to solve my problem. a bit of evaluation on this. And he the truth is purchased me breakfast because I discovered it for him. giving style to make the mediocre ones clearly fully understand specified complex subject matter. You truly exceeded visitors' expected results. mention fun guidance on this topic to Ethel.